Middlesex had their lead at the top of Division One cut to four points after rain meant they had to settle for a draw with Warwickshire at Edgbaston. Persistent rain saw an early lunch taken in Birmingham at 12:30 BST. Following a pitch inspection, play began at 15:45 BST with 36 overs to be bowled on the final day. Warwickshire resumed on 74-3 and Ollie Rayner removed nightwatchman Chris Wright lbw, but bad light forced Middlesex to settle for nine points. When play finally got under way, hosts captain Ian Bell (25 not out) remained watchful, as he shared an unbeaten 31-run fifth-wicket stand with Sam Hain (21 not out) to help keep the Middlesex spinners at bay. Yorkshire reduced the gap to Middlesex at the top of the Championship by one point after picking up 10 points in their rain-affected draw with Hampshire. Both sides, who play each other at Lord's in the last round of Division One fixtures, have three games remaining - while Surrey, who are 12 points behind Yorkshire, have played a game more than both teams. 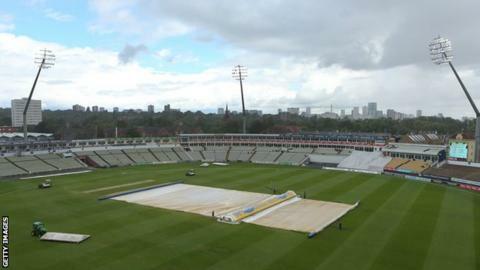 Warwickshire director of cricket Dougie Brown told BBC WM: "It's another match badly damaged by the weather and I guess we were on the right side of this one. That's four against us, two for us this season. "We have got two very important games coming up and it was important we did not lose this one. We're delighted to come away with a draw because those five extra draw points get us a little bit closer towards a respectable position in the table. "Middlesex played really well and put pressure on us. It was quite a big toss to win but they made best use of it, bowling very well in the first innings in helpful conditions." Middlesex captain James Franklin told BBC Radio London: "It is frustrating, but we can't control the weather. We knew it was coming but you can't play to that too much because we had to get a total on the board. "Yorkshire have been frustrated by weather as well, so it's another game down, three to go and there's an interesting 12 days ahead. "It's unfortunate that Adam Voges has had to stay back in Australia but they govern what he does. It gives an opportunity for someone and Stevie Eskinazi did a great job in this game."